This Hampton Inn - Airport Pensacola Florida hotel is just .2 miles from the Cordova Lanes 4 miles from Carmike Cinemas 8 miles from the Naval Air Museum and I-Max theatre and 12 miles from the Pensacola Beach. Within .7 miles of the Hampton Inn Pensacola-Airport hotel guests can dine at Bonefish Grill Red Lobster Panera Bread TGI Friday*s O*Brien*s Bistro Chili*s Applebee*s Logan*s Roadhouse or Olive Garden. 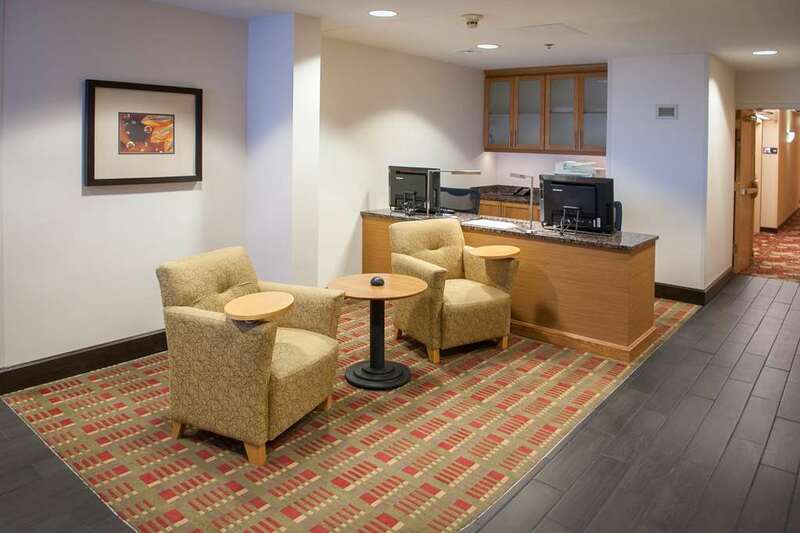 At the Hampton Inn Pensacola-Airport Florida hotel guests will enjoy a variety of amenities including a complimentary hotel shuttle within a 1 mile radius. A free hot breakfast is served daily and Monday through Friday hotel guests at this Pensacola Florida hotel can take advantage of our free On the Run Breakfast Bags. Services available 24 hours a day include a business center and coffee and tea in the hotel lobby. A complimentary manager*s reception serves drinks and hors d*oeuvres Tuesday and Wednesday evenings from 5pm to 7pm /excluding Thanksgiving and Christmas/.